Ike No.24 amiibo Nintendo Wii U/3DS is one of a range of character toys that you tap against your game pad to bring the character to life in your game. You can train your amiibo by playing with the character in the game to customise its moves and expand its abilities. 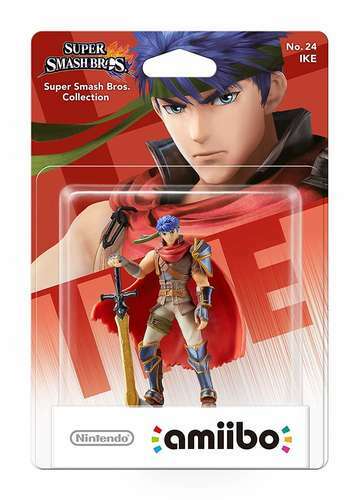 Ike is known as the legendary ‘Radiant Hero’ from the popular Fire Emblem series. He’s an expert swordsman with a powerful blade, and a veteran of Super Smash Bros.
Amiibo allows you to connect your favourite characters and interact with them on Super Smash Bros., Mario Party 10, Super Mario Maker and more. Compatible with Nintendo Wii U, New Nintendo 3DS and also Nintendo 2DS and 3DS via NFC writer/reader accessory.